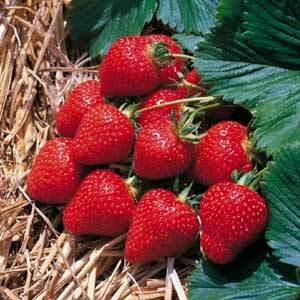 An outstanding dessert strawberry of excellent flavour and colour. Plants are vigorous with an erect habit and has very good resistance to powdery mildew and other fungal leaf diseases. Crops 10 days later than Elsanta. This variety is the one to choose for flavour. If the crop turns out as good as the length and number of the roots lead me to expect I shall be very happy. I was exceptionally pleased with the 10 runners I received from Blackmoor. The plants were positively bursting out of the bag with health due to their large size. This bodes well for their overall vigour and disease resistance in years to come. Bought runners of Florence in March 2017. Had a good crop of lovely juicy flavoursome fruits during the summer. Just wanted to praise Blackmoor for the quality of plants they offer. I ordered four varieties of strawberries and had to plant them in pots because the ground for them wasn't prepared. Time to plant them out now and all 40 plants have very strong roots and top growth.